UNSW Canberra will alert the ACT government to its plans and financial requests for a potential expansion to Reid by the end of January next year. The Group of Eight institution and the territory government have signed a memorandum of understanding aimed at guiding discussions on the proposed development – the first formal step towards growing the university’s footprint into Canberra’s city centre. UNSW Canberra’s vision would convert part of the Canberra Institute of Technology’s grounds and prime land on Constitution Avenue into a second campus, which would include an innovation precinct, increased space for research, a teaching facility and student accommodation. The university has predicted the expansion could see up to 10,000 extra students – mostly international – flock to the capital for what will likely be specialised courses and research, some of which would be linked to the university’s existing relationship with Defence. UNSW Canberra rector Michael Frater said the number of students the university attracted would depend on how much land could be developed into accommodation. “At one extreme, 10,000 might be possible, at the other extreme it might be a number that’s somewhere around half that,” he said. Professor Frater said the university was partway through an internally-led feasibility study, where it was working out how much land it wanted and other requests it may make of the ACT government. The government will respond to UNSW’s draft business case by the end of February with the final proposal to be ready by March 31. The memorandum of understanding has formalised ongoing consultation with CIT and demands detail from UNSW Canberra on the potential use of the land, the description and design principles of the proposed campus and the nature of the new services that would be provided. Professor Frater said the campus development would allow Canberra to compete with Sydney and Melbourne in the international education market. 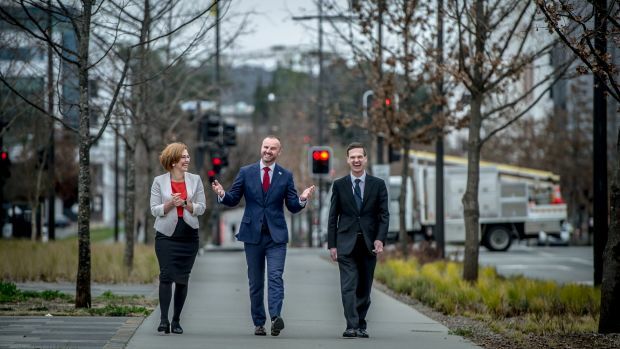 “One of the opportunities for Canberra in this is by having two Group of Eight universities recruiting international students, there’s a fantastic story for the city to tell about Canberra as an education destination,” he said. Chief Minister Andrew Barr noted that international education was the ACT’s largest export, with 14,000 international students calling Canberra home. “The construction of a major new campus has the potential to serve so many of our ambitions as a city: urban renewal, diversifying our economy, attracting and retaining talented people and making the ACT an even better place to live, study and invest,” he said.